A dedicated collector of fine timepieces, Sandro Colarieti found one major aspect of the watchmaking industry lacking. There were no high quality storage cases for maintaining an important collection. Thus, in 1989, the Scatola del Tempo Company was born. With ergonomic designs and exquisite silks for the linings, the Scatola del Tempo cases are, in reality, exceptional pieces of art. Each has fine detail in its fastenings and the outer leather finish, making the customer as proud to own one of these cases as they are to own the precious contents. The Scatola del Tempo winding watch boxes are the most luxurious and technically advanced cases available to preserve and protect valuable timepieces. Eventually, the company added watch winders to their special production lines. * The Scatola del Tempo winding cases have been chosen by some of Switzerland's most distinguished manufactures as their official cases. * The cases are made by the hands of the best Italian master artisans. * The hardware (clasp and hinges) receives anti-magnetic treatment, to prevent interference with the watch mechanisms. The exterior structure of many of these cases is made from evaporated beech wood, covered in natural organic tanned leather. The interior is made of flexible polyurethane resin and covered in jacquard silk in paisley design or in leather. The clasp is gilded brass, which is marked and numbered by hand. 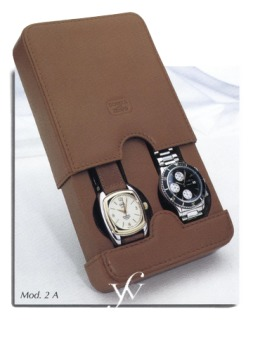 Single watch cases are available, as are cases that hold a large collection. Non-winding cases The non-winding cases are meant for use with any kind of wristwatch, despite the size. The cases can be custom ordered to provide an opening of the correct width. * 4+4 RA: This briar-wood box is designed to hold four watches with leather straps, plus four with rigid bracelets. * 2A: This box is for two watches with leather straps or flexible bracelets. It comes in black, red, or natural leather. * 1P: This is a men's jewelry box for travel, containing space for one watch and accessories (e.g., cuff links, rings, lighters, pens). Winding cases: Sandro Colarieti The winding cases were first introduced in 1990. The Sandro Colarieti's 1RT was very well received and it is without doubt the best way to store a watch in a safe or luggage when traveling. The internal device is designed to wind automatic watches and is especially useful with timepieces containing perpetual calendars. Brilliantly crafted, it is run by a precision, micro motor with an electronic card that is equipped with a microchip. To wind the watch, the rotors rotate both clockwise and counter clockwise and can run for more than one year using standard alkaline batteries. These boxes focus on rotational speed, number of revolutions per minute, turning direction of the rotor, and the time interval of function of the rotor in a day. The traditional models of winding boxes offer ten different re-winding programs. The user can pre-program the system to simulate his activity level. In this way, the watch is wound - but not over-wound. * 1RTSL: This box is designed to keep one automatic watch wound. It comes in black and is made of nylon and black leather, with an opening with a gold-colored metal ring. This allows the watch to be visible while stored. * 3RT: This box is for keeping three automatic watches wound. In comes in black or red leather and is also available in the Squelette version with briar-wood base and the motor gears visible in black polished brass.